Padtheway Salukis is based in Australia. The kennels are situated at Douglas Park, a semi-rural area, about an hours drive South West of Sydney on five undulating acres. The Prefix, derived from the well known Padthaway Estates area of South Australia, renowned for quality red wines, was originally linked to Border Collies bred by Hilary. Hilary started ‘in dogs’ in 1978 with Border Collies, which she trialled and showed with moderate success. 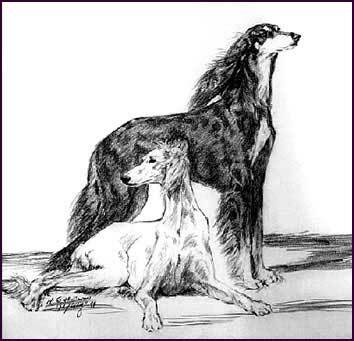 She obtained her first Saluki, a dark grizzle female, Aust CH Baghdad Desert Dazzler, in 1988. The foundation stock combined most of the top winning and producing lines available in Australia, with English, North American and Scandinavian influence. All traced back to the highly successful Kiabe Kennels of Dr Margaret Giles. The cream male "Banner", BIS SBIS GD CH Kiabe Qariban, the Tri-colour male "Fred" BIS SBIS CH Khamseh Aladdin, the ivory female "Injah" CH Kiabe Injah and the pale gold female "Summer" CH Ibnzaad Amira Min Wakah. Saluki, Sighthound and All Breeds Judges from around the World continue to bestow top awards on our Salukis. Some of our more memorable wins are under Saluki Specialists such as: Linda Scanlon (Aaraki), Ute Lennartz (Mata Salamata), Ken & Dianna Allen (Jazirat), Nick & Marie Bryce-Smith (Saruk), Trevor Hiscock (Roaringwater), Zola Rawson (Mumtaz), Keith Prior (Zomahli), Audrie Van Stellant-Benoit (Har Kala Rachi) and Sighthound Specialists including Rodi Hubenthal, Espen Engh, Kari Nylen-Engh, Nenne Runsten, Paul Stanton, to name a few. We are delighted to have done so well with our first litters, proving to ourselves that we are on the right track. Whilst we breed mainly for ourselves, we now have a number of dogs in the show ring across Australia, in the USA, Canada, Ireland and England winning for others. Our aim is to breed Salukis that are healthy, beautiful, functional, true to the standard, aloof with stable temperaments and universally acceptable to Specialist and All Breeds judges alike. Adult breeding stock has clearances for eyes, hips and hearts. We also monitor for Thyroid dysfunction on a regular basis. Photo credits go to Barbara Killworth (Cabal), Linda Frisen, Sally Stasytis, Michael Trafford and Hilary.